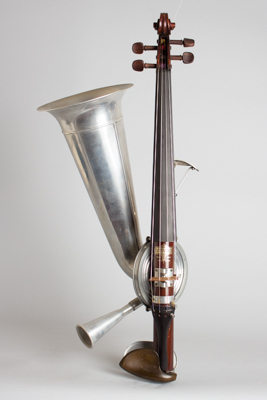 Stroviols Resophonic Viola, c. 1910, made in London, England. This is an exceptionally rare Stroviols viola, far less common to see than the violin variation. The sound of the instrument is quite loud, and projects very well. It is of course a much more tinny or metallic tone (compared to a wood-bodied instrument), yet still quite full and beautiful. The history of the Stroviols company is fascinating, and even plays a role in the development of the National resonator instruments! John Matthias Augustus Stroh, an electrical engineer in London, was a maker using the name Stroviols as a trade name for his phono instruments, which included violin, viola, cello, bass, ukulele, Hawaiian guitar, mandolin, and also one-string phonofiddles. The design was patented on May 4th 1899 -- UK patent GB9418 titled "Improvements in Violins and other Stringed Instruments" which was accepted on March 24th 1900. The patent described the use of a flat metal (other materials are also mentioned) diaphragm in the voice-box (reproducer) of a violin to mechanically amplify the sound. On February 16th 1901 he applied for an additional UK patent (GB3393) titled "Improvements in the Diaphragms of Phonographs, Musical Instruments, and Anologous Sound-producing, Recording and Transmitting Contrivances" which was accepted on December 14th 1901. This effectively extended the first concept to now use a conical resonator with corrugations at its edge, allowing a more "rigid" diaphragm. Interestingly, his failure to patent his inventions in the USA allowed John Dopyera and Geo Beauchamp to subsequently obtain US patents for the tricone and single cone designs used in National resonator instruments. Overall length is 26 3/4 in. (67.9 cm. ), 12 in. (30.5 cm.) width. Scale length is 14 1/2 in. (368 mm.). An exceptionally fine example of this very rare instrument. Very little wear to the finish; one or two minor dings in the large bell. All parts are original, aside from new tuning pegs. Bell diameter is 7 3/16". Excellent Condition.